The Irukandji Jellyfish (Carukia barnesi) is found in the waters of northern Australia and Florida (USA). 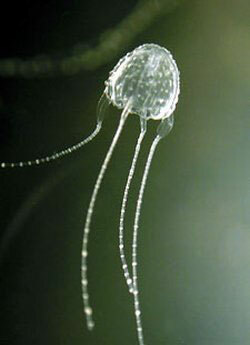 It is a deadly but small jellyfish only 2.5 centimeters in diameter. The Irukandji is believed to be one of the most venomous creature in the world. The name Irukandji refers to an Australian Aboriginal tribe that inhabited the Palm Cove region of northern Queensland. Irukandji has stingers not only on its tentacles but also on its bell, it is very small and fragile an cannot be kept in a normal aquarium, if they hit the side of the aquarium the impact will kill it. It is believed that the Irukandji syndrome may be produced by several species of jellyfish, but only Carukia barnesi and Malo kingi have so far been proven to cause the condition. In 1964, a doctor called Jack Barnes spent several hours in a wetsuit lying in the water near Cairns searching for a jellyfish responsible for 'irukandji syndrome' - a set of symptoms suffered after a jellyfish sting that could put the victim in hospital. Irukandji is the name of an aboriginal tribe that once lived in the area around Cairns in north Queensland.